We've all heard it many times, investing in ourselves is the best investment we can make. Warren Buffett, one of the richest men in the world and considered by many to be the greatest investor who ever lived, is fond of saying, "Ultimately, there's one investment that supersedes all others: Invest in yourself." You can listen to one of his many speeches on this subject below. Is that really true though? Is it better to invest in education instead of stocks when the cost of a 4-year college degree in the USA can run up to $334,000 over 4 years according to Forbes? That's a major investment, you'd better be sure you're getting a return on it! 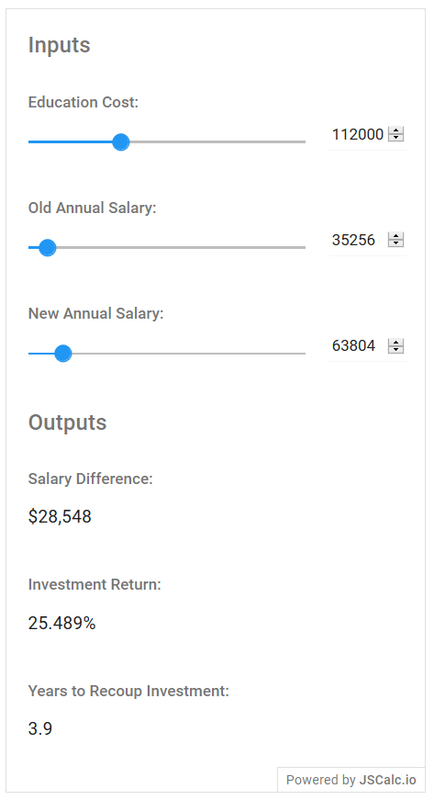 To answer the question, I dug through several salary surveys, looked at costs of education, and ran the numbers through the online education investment return calculator at the end of this article to see if this is really worth investing in. What Does Traditional Education Cost? Let's start with college because that's what most people think of when they think of investing in themselves. While costs of a four-year degree can be up to $334,000, the average cost for a four-year degree from a public college is $28,000 per year according to Forbes. $28,000/yr X 4 years is $112,000 total. How Much More Will You Make With a College Degree? The salary numbers in all of these calculations may seem really high or really low to you depending on where you live and what you do. Bear in mind that if you live in an area where houses start at $50,000, you're probably going to be making much less than people in a metropolitan area where houses start at $500,000. For purposes of this article, we'll be focusing only on averages. According to CNN Money, the average college grad makes $1,227 per week, compared to the average high school grad who makes $678 per week. That's a difference of $28,548 per year ($1,227-$678 * 52 weeks/yr). Take $28,548 per year (average difference in salary between a high school grad and a graduate with a 4-year degree) divided by the average total cost of education ($112,000). That's a 25% per year return on investment for an average four-year degree from a public college. Compare that to stocks which have an average rate of 7% return on investment! Bottom line, a $112,000 investment in your college education should be a no-brainer! 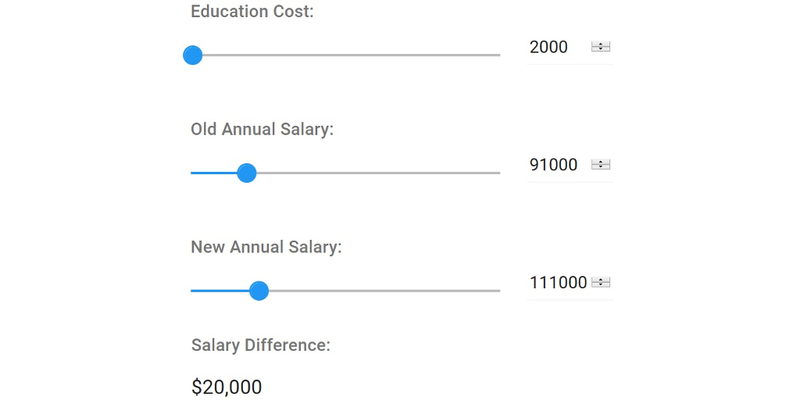 On average, you'll recoup those costs in 3.9 years, and then you'll be making $28k more each year on average than you would have if you had not attended college. I know from my personal experience with adding a few certifications early on in my career which bumped my salary by more than $20,000 every year, that continuing education after college can also be an amazing investment. I encourage you to consider investing in certifications in order to get another major salary bump. As you'll see in a moment, continuing your education after college can provide enormous returns on your investment. Our training partners offer many certification programs. Let's take a quick peek at what adding a PMP® Project Management Professional Certification to your resume might do as an example. For a few thousand dollars invested in certification, you can expect to increase your base salary by $20,000 EVERY YEAR according to this PMI Global Study. Take a look at what that investment looks like on our education investment calculator below. As I mentioned earlier, the salary numbers in these pictures may seem high or low to you based on your area so I encourage you to localize this by plugging in your own research into the calculator at the end of the article. An easy way to think about this is that if houses in your area start at $50,000 you are probably not going to be making as much as a major metro area on the coast where the houses start at $500,000. It is all about supply and demand. Regardless of where you live, what I found through researching this is that the percentage difference in salary with and without certification is pretty universal. I looked at just the PMP certification in this example, but most industries including medical, IT, legal, and financial place a premium on certifications. They are almost always worth getting. Stop and think about what we just discussed for a moment. You can invest a few thousand dollars in continuing education and potentially make $20,000 or more in extra income every year. That's a 1,000% return on your investment!!! If the numbers are off even by a factor of 100, you are still outpacing the average stock return. That's one hell of a safety net. In investing terms we call that a significant margin of safety or margin of error. Even if our returns fall a bit short of projections, with that margin of safety, you can be sure it's still a better investment than nearly any other investment on the planet. Buffett also says, "I don't look to jump over seven-foot bars; I look around for one-foot bars that I can step over." To me, investing in yourself is a 6-inch bar you can crawl over. I encourage you to do some research for yourself, but I believe you'll find the same kinds of returns on most certifications. I personally added more than $20,000 a year early on in my career by taking a few IT certifications which led me to get hired on at Boeing and eventually to my current position. I invest in myself every chance I get. That habit has allowed me to rise to the top of my company and even get hired on as a Director on the boards of several other companies. It would be hard for me to even calculate how big of a return on investment that has been. I believe in it so strongly that I created this site which is all about investing in yourself. Click here to explore common certifications for most industries or click on the banner below to start investing in yourself. Joining mastermind groups like the ones we run here at The Personal Growth Channel can be another area to invest in. I know of business owners that have added millions of dollars to their bottom line by networking with the right people, it's hard to even begin to calculate the returns on that investment. If you can add some additional streams of revenue by branching outside of your comfort zone with some help, that also can have a major impact on your financial life. Keep in mind that most millionaires do not have just one income stream, many of them have up to 50 different income sources. If becoming wealthy is one of your goals, you'll probably need to branch out a little beyond your job and retirement savings and getting into one of those groups can be a good way to achieve your goals. You should also consider investing in yourself through Toastmasters, an organization that allows you to practice your communication and leadership skills plus build relationships with other like-minded individuals. CNBC found that oral and written communications are the #1 soft skill that employers look for, so investing in improving that should be at the top of your list. Want to play with the numbers yourself to see what investing in yourself could do for you? Here is the simple online education investment calculator that I used for this article. 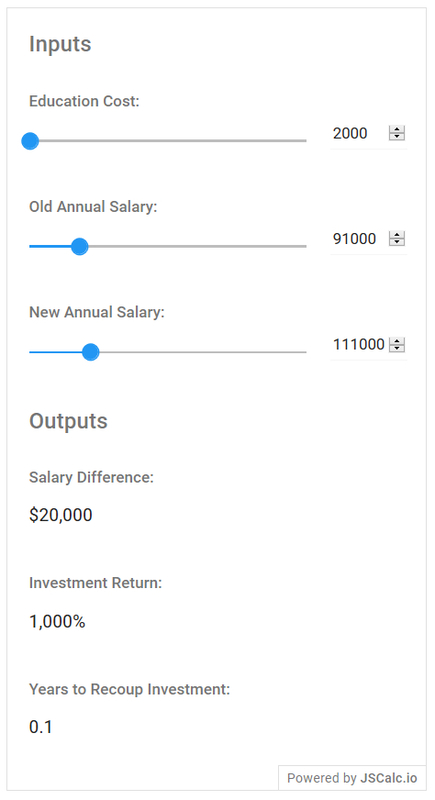 Drag the sliders or type in how much you will invest in your education, your current salary, and what you expect your new salary will be and it'll spit out your return. I think this goes to show that Warren Buffett was right when he said: "Investing in yourself is the best thing you can do." By my calculations, you are NOT going to find a better investment than investing in yourself! By the way, investing in yourself is what this site is all about! If you are interested in investing in yourself, click here to sign up for your membership today. You'll get special offers from our course providers, discounts from major retailers, a book recommendation each month to stretch yourself, a chance to work with a life and career coach, and weekly inspiration.